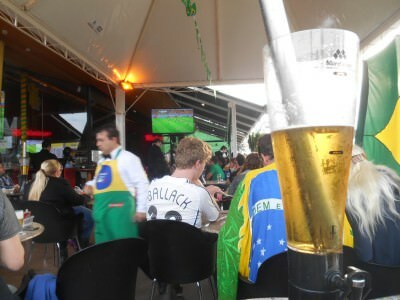 View from a beer watching “The 7-1 match” in Foz do Iguacu, Brazil. 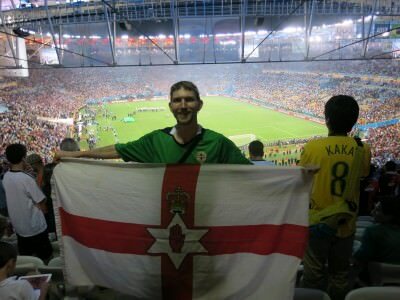 You may have read my post on 41 places I watched the World Cup first round matches. This is the sequel and the final part as my journey round South America took me to a few more places on my travels as I attempted to catch up and keep up with the knockout stages of the World Cup 2014 in Brazil. Here are the 15 different places I watched the knockout stages. Flying out of Georgetown the day of the first second round match, Brazil v Chile. 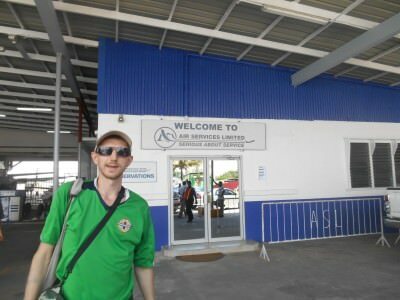 We were boarding our flight to the Amazon jungle and the magical Kaieteur Falls when the first knockout match took place. We watched the while first half in the lounge while waiting for our flight. It was 1-1 between Brazil and Chile and we saw both goals before we headed to Kaieteur. We later found out that Brazil had won it on penalties. 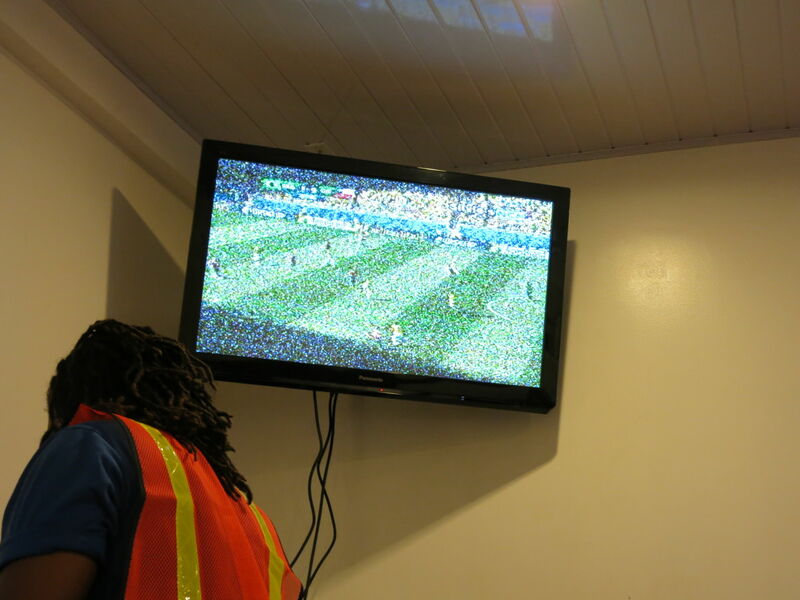 Screen in the airport in Guyana for Brazil v. Chile. We found a cool local bar opposite our hostel (Rima’s Guesthouse) in Georgetown and watched some highlights in here (plus the extra time of Germany v. Algeria). They had Banks on tap which was the only place I tried draft beer in Georgetown. First of all though we watched the highlights of Colombia 2-0 Uruguay including Rodriguez’s class goal. 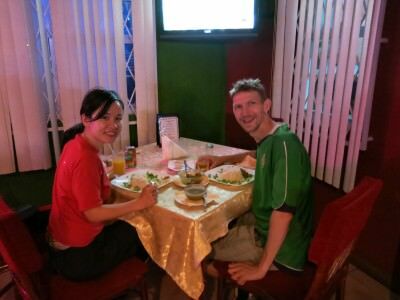 Dinner in Hibiscus watching Colombia v. Uruguay in Georgetown. 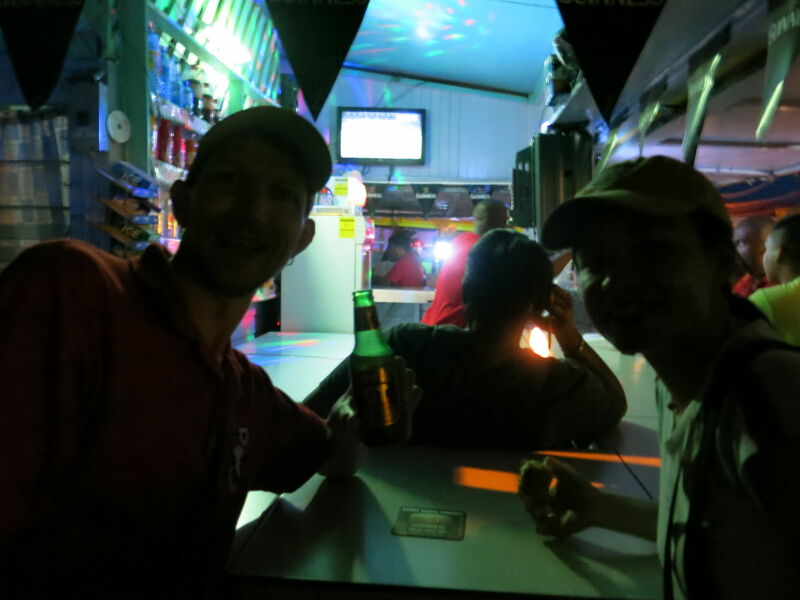 While we waited on our boat across to Sloth Island from the riverside village of Bartica, I was walking down the street aware that the Netherlands v. Mexico second round match was on. 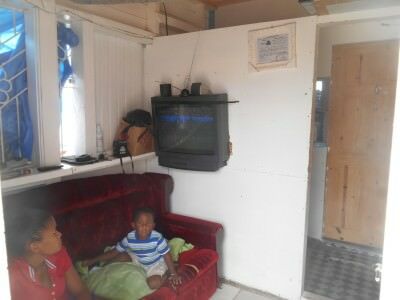 Low and behold a guy in a wooden house by the river had a TV on and was watching it with his family! The score was still 1-0 as we boarded our boat to Sloth Island. Netherlands later won 2-1 but we had to settle for highlights later that night. Watching Netherlands v. Mexico is some guys house in Bartica, Guyana. The Costa Rica v. Greece match headed into penalties and we were in the unknown town of Parika when it was on. We quickly headed to Fat Head’s Pub (which is on a prominent street corner near the ferry terminal and has massive Guinness signs). The atmosphere was crazy as the Costa Ricans amazing reached the quarter finals for the first time. Watching the Costa Rica v Greece penalty shoot out in Fat Heads pub in Parika, Guyana! While walking through Georgetown in Guyana I noticed a cool, upmarket looking bar called Palm Court Pub. I knew it would be worth popping in for their cheapest beer and catching the Nigeria v. France match on their many big screens. I wanted Nigeria to win but two late goals won it for the French and that was that. Palm Court pub for France v. Nigeria. Our Guesthouse in Georgetown in Guyana was a cool place to relax and on a hot day after touring the sights of Georgetown, we sat down on the settees in the lounge to watch Algeria v. Germany. We were joined by a cool backpacker and couch surfer from Australia, Daniel Waugh who runs an excellent blog. We watched up until the 90th minute in here, when it was 0-0. Then we headed across the road back to the Hibiscus pub for the conclusion. The tactic seemed to work as we saw all 3 goals in there as Germany won 2-1 in extra time. 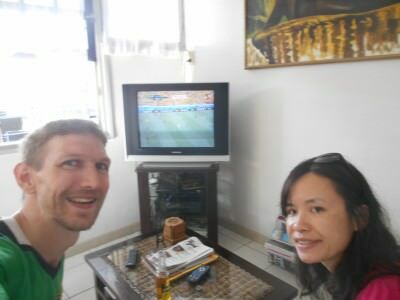 Daniel and Hiro join Panny and I for the Algeria v. Germany match! The second round came to a close as Argentina sneaked a 1-0 win over Switzerland in extra time and Belgium knocked out the USA. 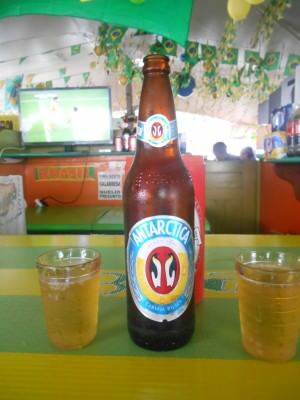 We made it back to the fantastic Guesthouse Amice just in time for the USA v. Belgium match and I grabbed an ice cold Parbo beer as we watched it from our bedroom. 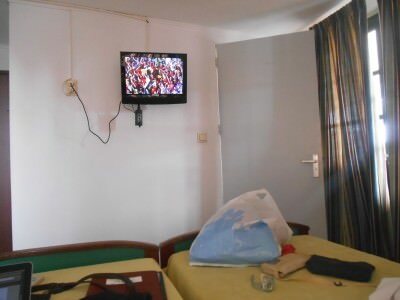 Lazing it out in Guesthouse Amice watching USA v Belgium. After a two day break from the World Cup, it was Quarter Final time with two matches each day for the next two days. I had originally hoped that the Netherlands would be playing while we were in Suriname as an ex- Dutch colony would be a cool place to watch it. However the Netherlands match was the following day so we had to settle for watching Germany beat France 2-0 and then the classic Colombia v. Brazil match, which Brazil won 2-1 thanks to a super David Luiz free kick. We watched it in the lounge with the hostel owners with some ice cold Parbo bier! 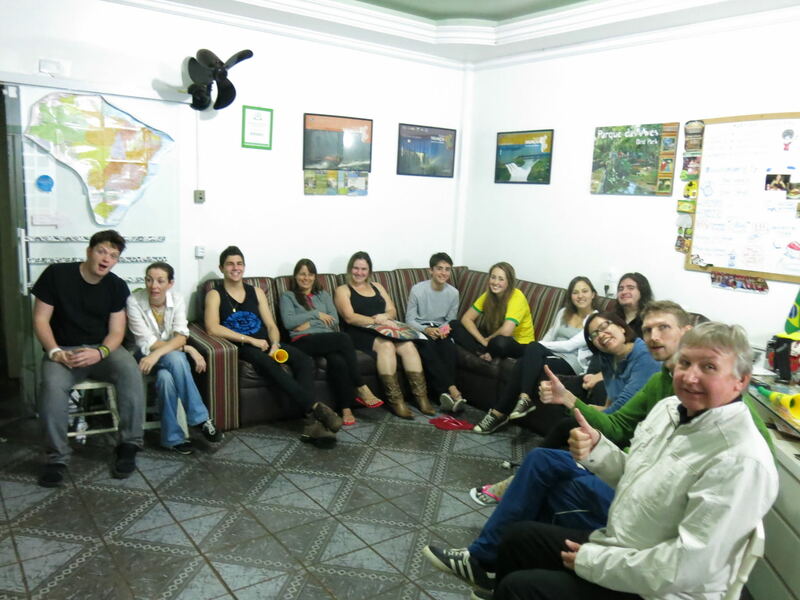 Watching Colombia get knocked out by Brazil in the TV in Guesthouse Amice reception. We were back in Brazil to see the Quarter Finals come to an end and we checked into the Hotel Unidos in the city of Belem. It was here where we lay in bed on a lazy relaxing afternoon to watch Argentina squeeze past Belgium. A single goal from Higuain did it and on the final whistle we headed straight out to explore the city and make sure we were in a pub by the time the last Quarter Final kicked off. 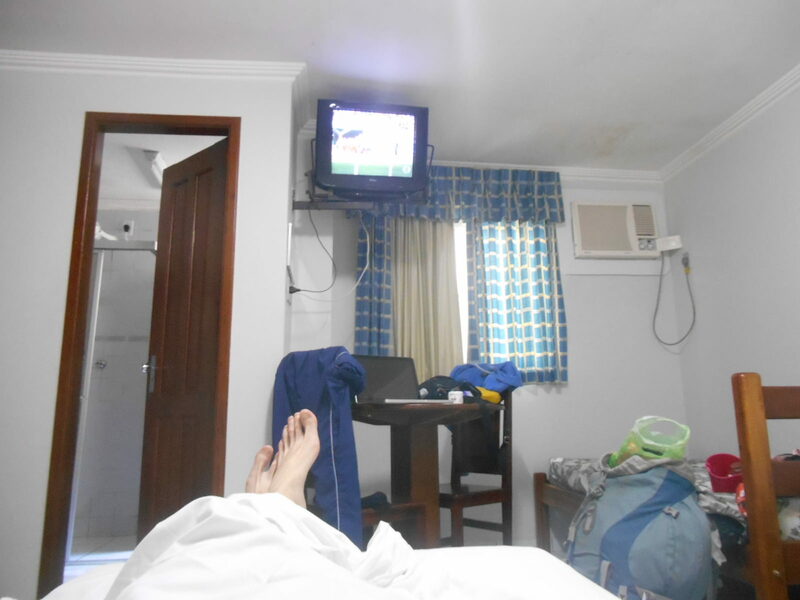 Another lazy hotel day in Belem catching up on rest and the Argentina v. Belgium match! This is when the Quarter Finals came to a close for us. As we backpacked through the streets of Belem, I was on a quest to find a decent bar to watch the mega exciting match between Netherlands and Costa Rica. At this point, there were only 5 teams that could still win the World Cup. How amazing that Costa Rica was one of them. Beers in Belem for the final quarter final! 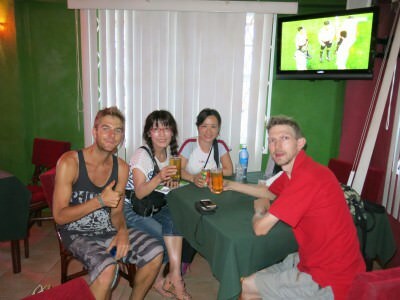 We found a great bar in a market by the sea and watched the entire match, 90 minutes, extra time and penalties in there. I really wanted Costa Rica to win in the end but an inspired substitution by the Dutch led to Krul saving the penalties and the Dutch becoming the fourth team into the Semi Finals. 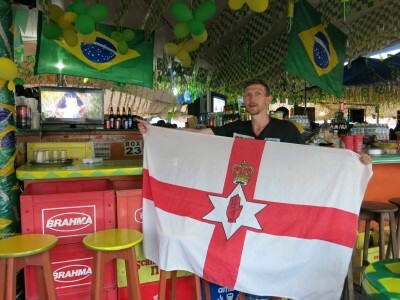 Flying the Northern Ireland flag in Belem watching the last Quarter Final. 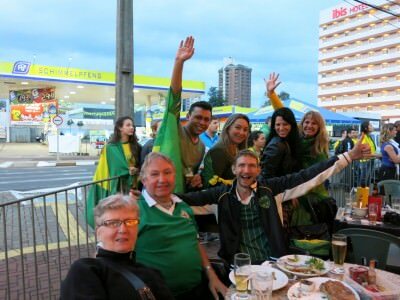 After the quarter finals had ended, we passed back through Sao Paulo again enjoying a night out there and a relaxing first night in Foz do Iguacu. In between times I had met up with my parents! I could now watched the last 4 matches of the World Cup with my Dad. Watching a World Cup match with my Dad for the first time in 8 years! After touring the waterfalls and seeing the entrance to the Itaipu Dam, we headed into the city centre of Foz do Iguacu. Initially we wanted to watch the match in Hafien Chopp but it was packed so we made it into Capitao Bar instead and blagged the last table just a few minutes before kick off – Mum, Dad, Panny and I. It was the first time I would watch a World Cup match live with my Dad since 2006 – when we watched a match in a bar in Bournemouth, England (neither of us could remember what match). First time to watch a World Cup match live with my Mum since 2002 World Cup! Watching Brazil 1-7 Germany – yes really it was 7-1!! 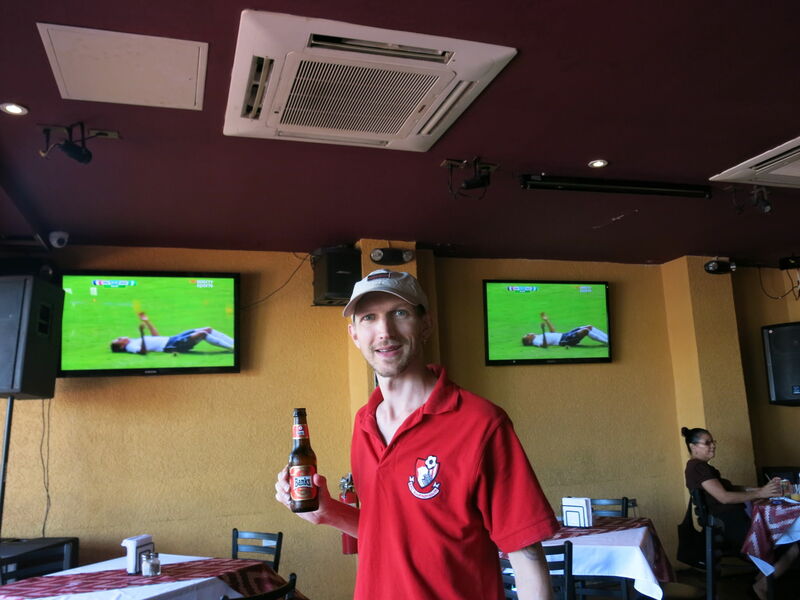 And yes – it was a superb match, great atmosphere in the pub and Germany won 7-1!! Easily one of my favourite hostels from my travels, the Hostel Green House was the venue for watching the second semi final. We chilled out this time after a heavy night on the booze before. We watched it with the hostel staff and guests including Ben and Kitty from England and Leonardo and Graciela. I was hungover but had recovered just about for the epic penalty shoot out. Argentina won and Messi was in the final! The crew in the Hostel Green House for Argentina v Netherlands semi final. 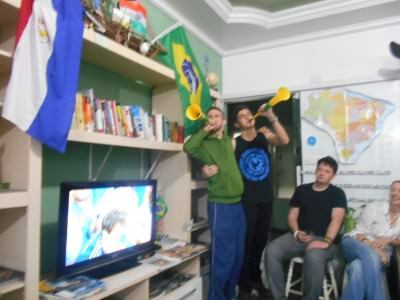 Leonardo and I blew the favulezas after the match. Favuzelas with Leonardo at the final whistle! 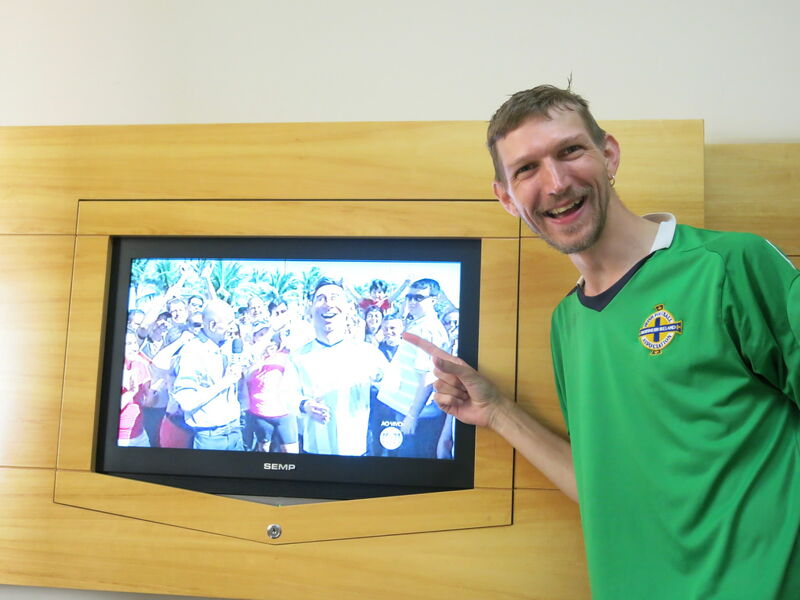 We watched the highlights each night in the run up to the third/fourth place match in our hotel room in Rio de Janeiro in Brazil. Watching the final previews in our hotel room – fake Messi masks! 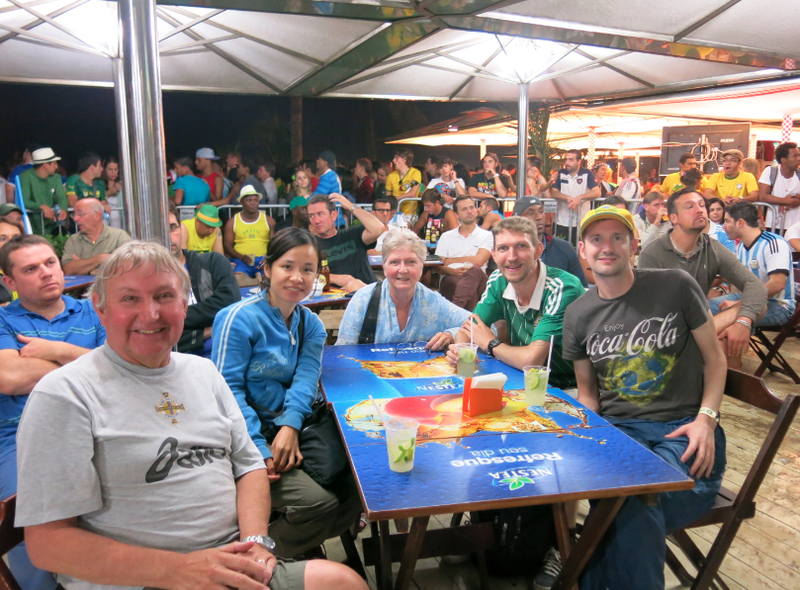 For Brazil’s final match we decided to head down to the beach to watch the third and fourth place play off. We were in a bar right beside Copacabana beach watching the Netherlands beat Brazil 3-0 condemning the hosts to 2 defeats, 2 draws and 3 wins in the finals they hosted. Even worse – they had shipped a total of 10 goals in their final two matches. Watching the 3rd/4th Place Match with Mum, Dad, Panny and Anthony. 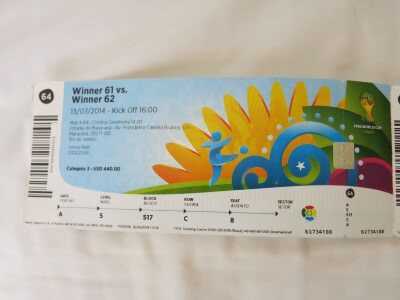 My ticket for the 2014 World Cup Final in Rio de Janeiro, Brazil. So adding 15 to the previous 41 makes a grand total of 56 different places that I watched the 64 matches in this year’s World Cup. But nothing will ever beat the place where we watched the 2014 World Cup Final. I was at the match! 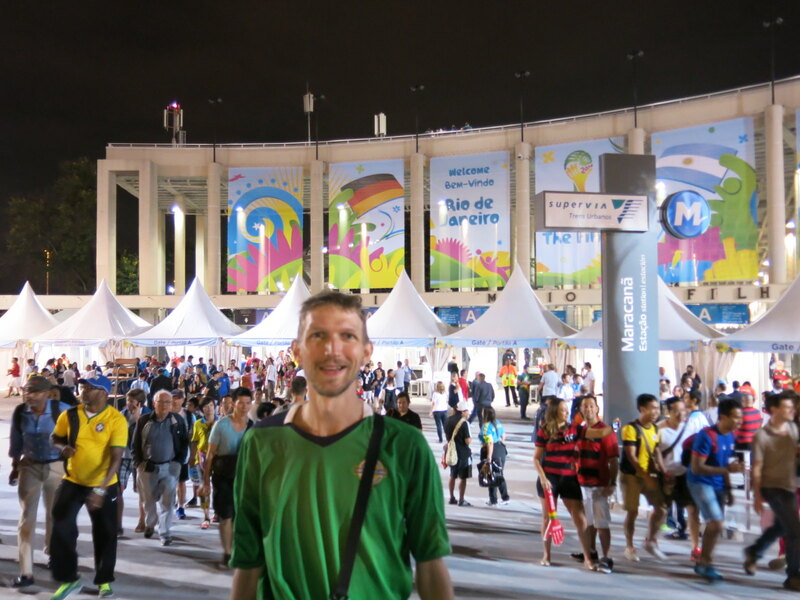 A childhood dream lived – attending the 2014 World Cup Final in the Estadio Maracana in Rio de Janeiro, Brazil!! We made it into the amazing Maracana Stadium in Rio De Janeiro. I lived out a complete travel dream and watched the World Cup Final live. Immense! 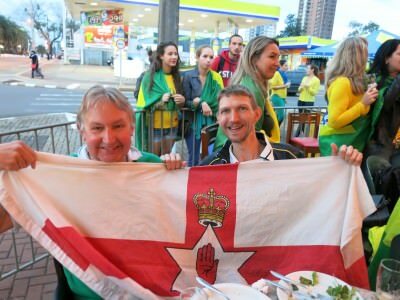 Of course I will have to write about my experience of watching the World Cup Final separately at some point, but I did write about it recently for the Unofficial Football World Championships website. 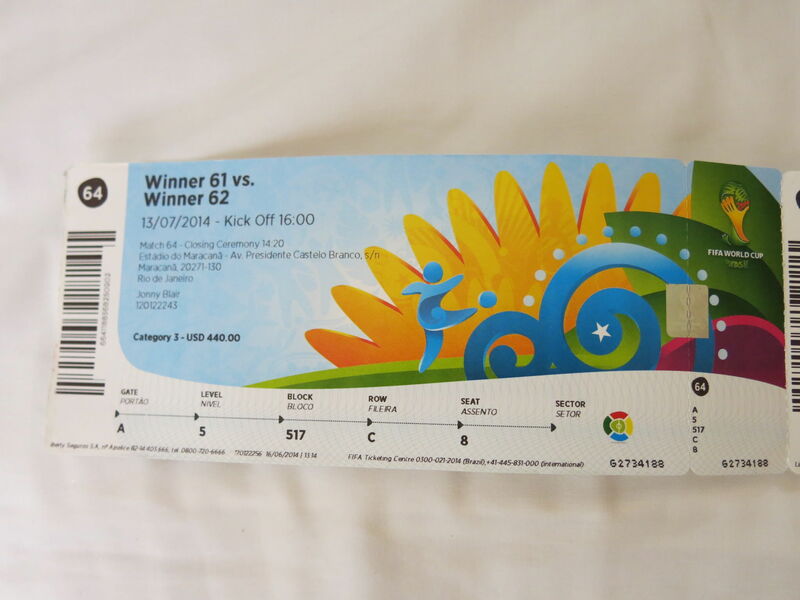 Attending the 2014 World Cup Final in Rio!!! Flying my Northern Ireland flag at the Argentina v. Germany World Cup Final in Rio De Janeiro, Brazil. This was probably the highlight of my travels since the Antarctica trip in 2010. This entry was posted in 2014 World Cup, Brazil, Destinations, Football, Lists, Other Football, Rio de Janeiro, South America, Sports, World Cup. Bookmark the permalink. I was going to ask if you had a chance to watch a World Cup match at Capitao Bar while in Foz do Iguacu! That’s where I got to see the infamous Croatia – Cameroon match where the Cameroon player headbutted his own teammate after their 4 – 0 loss. One of my favourite bars during my Brazil trip! Funny how you watched one of the most infamous World Cup matches, as well, with the Germany 7 – 1 romp over Brazil! Wow!!!! Can’t believe you actually got to go to the World Cup Final!!!!! Can’t wait to see your full review/experiences, I bet the Maracana stadium was epic. 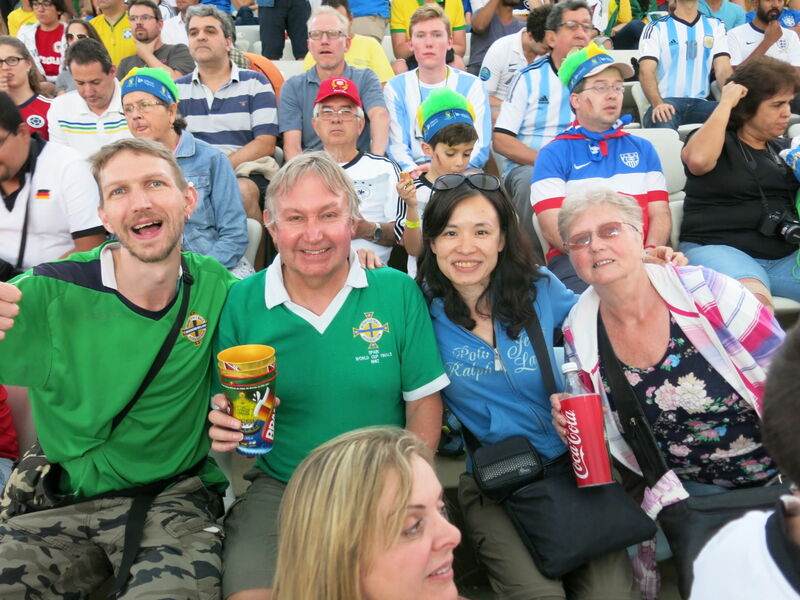 You have fulfilled many peoples lifelong dream there by attending the world cup final – so jealous!